Live Life in the Fast Lane and Win 1000 Free Spins Every 12 Hours! Visit PlayAmo Casino, and live life in the fast lane. There are thousands of free spins up for grabs in the Fast Spin slot race. Get there fast and then take it slow with refreshed prizes every 12 hours. PlayAmo Casino hosts an online pokie race known as the Fast Spin Slot Race. The race takes place regularly at the casino, with one game following the next. Each game comes with its own prize pool, and lasts for 12 hours. Every 12 hours, you stand the chance to win a portion of $1,200 and 1,000 free spins. Entering this promotion is easy. Simply play your favorite online pokies. Earn points for real money bets on pokies at PlayAmo Casino. Bets from €0.10 start to add towards your betting total. The amounts add up and when they reach €1, you get one race point. There are a few important points to remember when joining in the fun is the exciting Fast Spin Slot Race. All real money players at PlayAmo Casino may join this promotion. Play real money games at PlayAmo Casino and earn points to the Fast Spin race. Only play on online pokies count towards your totals. Playing other games, such as live dealer and table games, do not count towards your total. Place bets of a least €0.10 each time you wager on a spin. The casino awards points based on your cumulative wagering total on eligible games. Get one race point for each €1 wagered on pokies. The Fast Spin Slot Race lasts for 12 hours, so make sure to check your leaderboard position to gage where you are at in the race. The promotion pays prizes down to the 30th place on the leaderboard. PlayAmo’s general Terms and Conditions apply to this leaderboard promotion. If you play enough and get to the higher leaderboard spaces, you can win in more than one race. Simply make sure you play again in the next or subsequent races. Free spins winners play their spins on Bob’s Coffee Shop. Winners must wager their cash or free spins winnings three times to fulfill the casino’s play through requirements. You may take up to 14 days to complete the wagering requirements. Most online pokies provide themes along the relatively straight and narrow. But not Bob's Coffee Shop! Bob's Coffee Shop online pokie takes us on a trip to Amsterdam, a fascinating European city. Along with the history of Amsterdam, beautiful tulips, and exceptional art are special coffee shops. Take a quick look at this online pokie, and you will see that Bob's Coffee Shop serves legalized marijuana. The symbols on the reels include Bob, who also stands on the side smoking a joint. Bob comes with the biggest payouts. 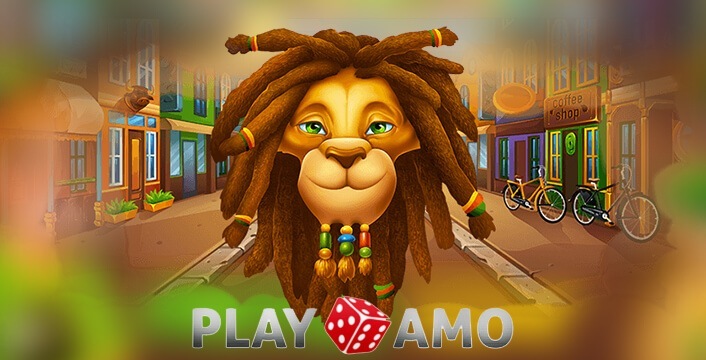 The next highest payout is the lion with dreadlocks symbol. The Bob’s Coffee Shop logo brings the next best payout, and is also the scatter symbol. There is also the purple bong with the marijuana leaf on its side, and the lips smoking a joint. Other lower paid symbols are the 10, J, Q, K, and A card symbols. The scatter symbol is the most important in Bob’s Coffee Shop. While three or more scatter logo symbols trigger a free spins round, they also act as wilds. As wilds, the scatter symbol substitutes for all other symbols, helping to form more or better winning pay lines. When the scatter triggers free spins, you get 10 free spins with an additional special symbol throughout. Before you spin your first free spin, one of the game symbols randomly becomes the special symbol. After regular wins pay out, the special symbol expands on the reels it lands on. The special symbol only expands when it can create an additional win by expanding. It is possible to get a winning combination made up of only the special symbols. Special symbol payouts go according to the regular pay table. Bob's Coffee Shop is a fun pokie from BGaming, and a great choice for the Fast Spin leaderboard prizes.